Off grid living can get real messy, real quick. 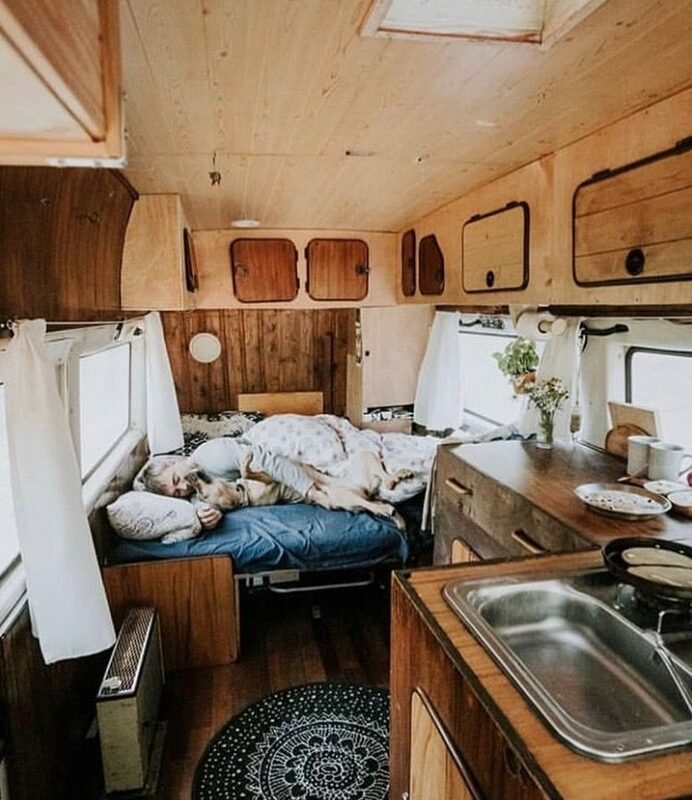 Messiness is heightened further when you’re living in a tiny house and even more so when you’re constantly on the move by travelling in a van. A tidy atmosphere is essential for comfortable living off grid and waking up to an organised space is a stress-free way to start a new day of adventuring. 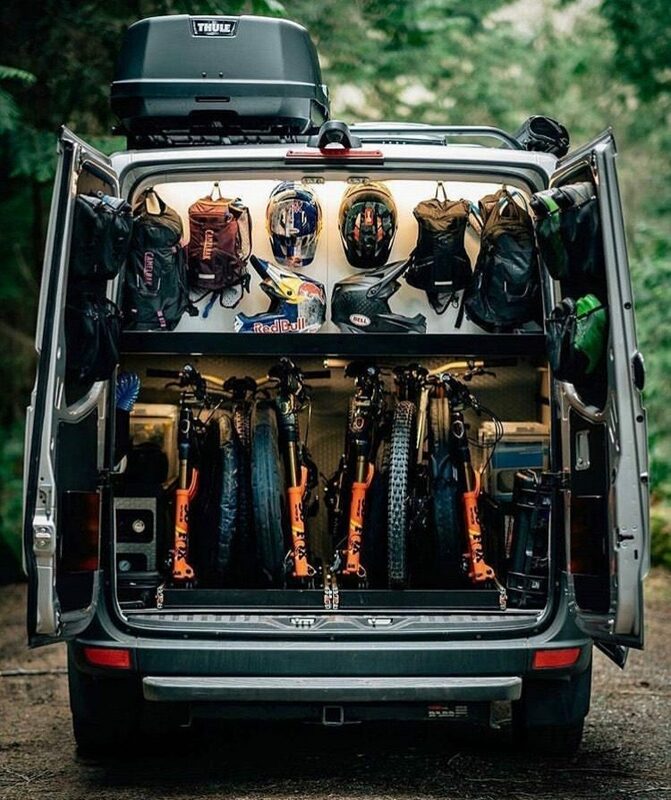 I consider myself an expert in living in a van but found that one of the U.K Van life Hardest Bits was keeping tidy. 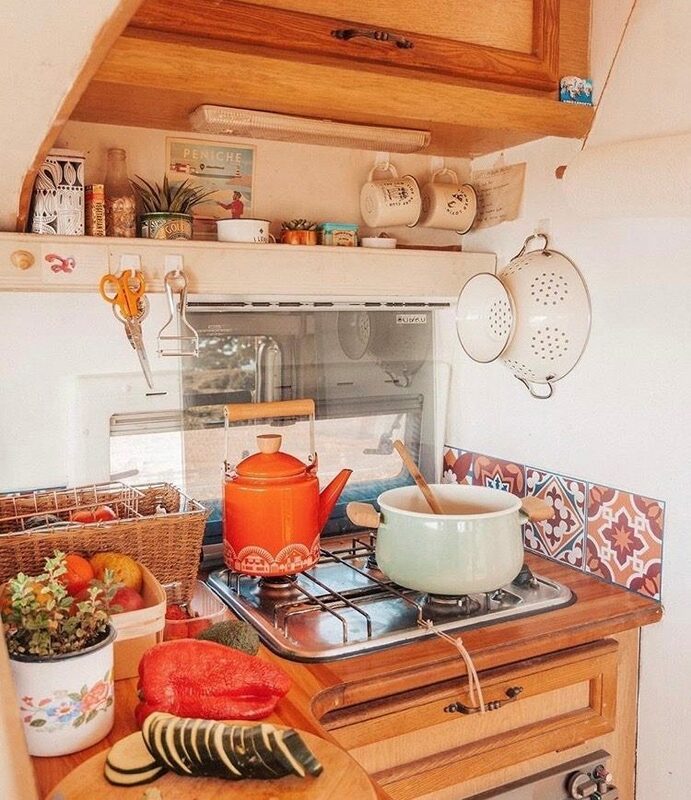 However, when you’re living the van life, you quickly pick up clever ways to stay organised in such a tiny home. So, keep reading below to find out ten organisational tips to keep tidy while living off grid. Our first tip for keeping tidy while living off grid is to minimise your belongings! Getting rid of stuff sounds obvious and something you probably already plan on doing before you start alternative living, but trust me, it’s harder than it seems. 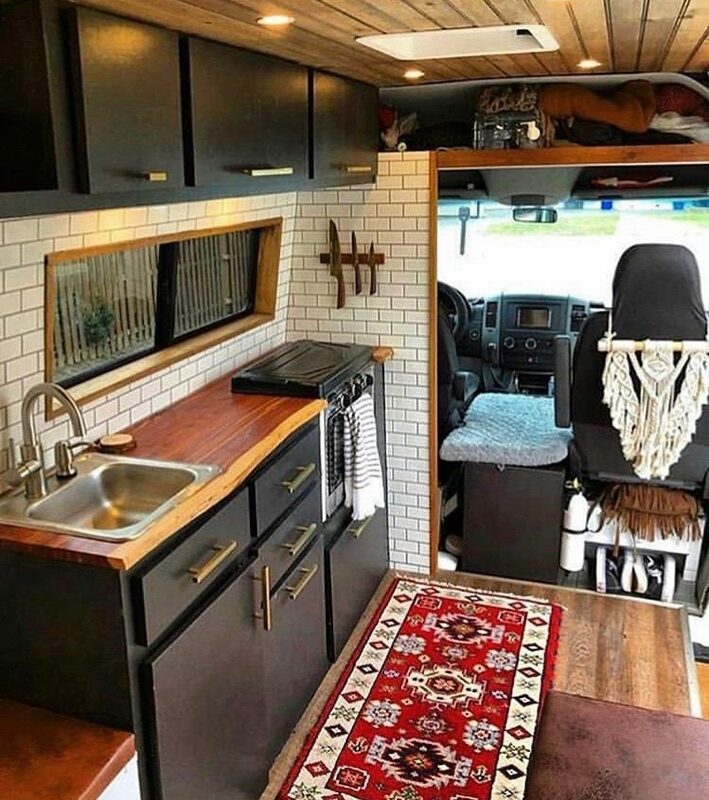 This transition is especially tricky if you’ve been living in apartments/houses/anything bigger than a van for several years. You ’ll have accumulated more stuff than you realise. The first stage of minimising your life’s belongings is easy, that vase your aunts gave you for Christmas, bin; that ugly sweater your brother gave you, bin; that top you’ve had, but haven’t worn for years, bin. You’ll soon have a pile of ‘must have items’ to bring with you when you start living off grid. Think again. You’re going to want to half this pile. The key to minimising your belongings enough to be able to live the van life, without looking like the lady in the van, is getting brutal. Things are just that, things. You don’t need two outdoor coats; one will always sit, tucked away, unused and forgotten about. 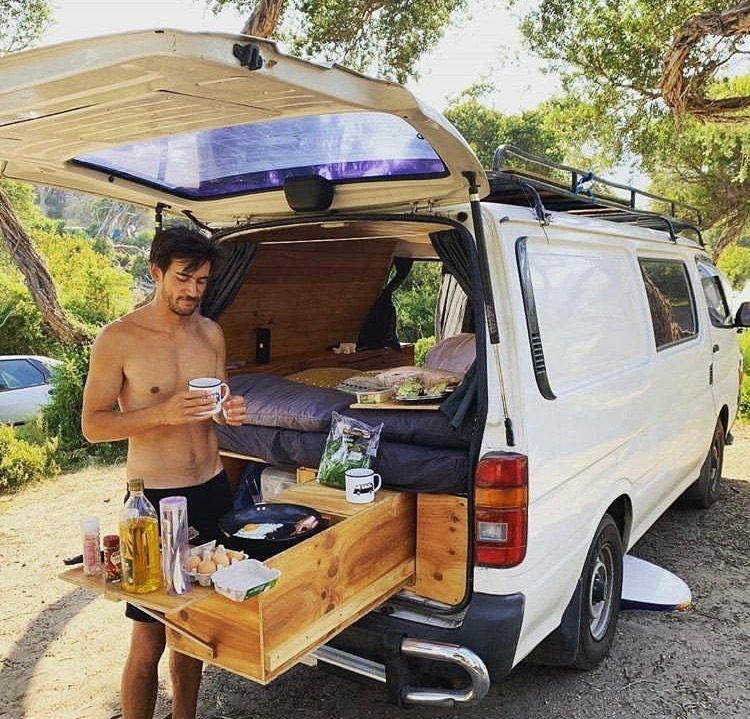 One of the best van life ideas we had was to live in our van while we still had the house so that we could get a feel for living off grid and discover what we really needed. We learnt that simplicity was key and we donated many things in our trial month. Almost a year an a half in and we still have too much stuff, be brutal and get rid of anything and everything you don’t need or use regularly. 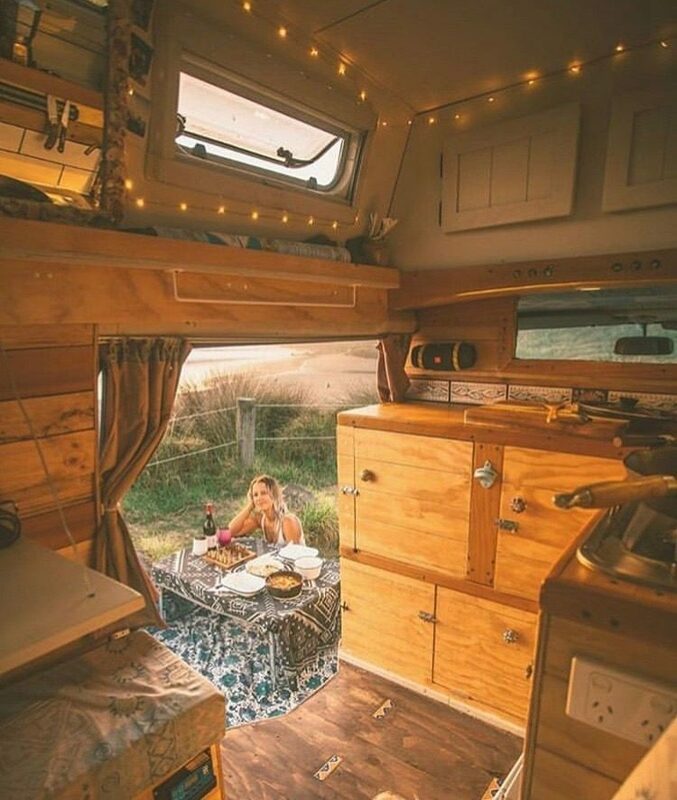 If you get the opportunity to build a camper van one of the best design features you could add in would be drawers, instead of cupboards. Sure, they’re slightly more difficult to build and a tiny bit more expensive to make than cupboards, but they will make staying tidy while living off grid so much easier! Think about it, what’s in the back of your kitchen cupboards at home? No one knows because no one ever wants to rummage right to the back of the cupboard to see what’s been sat there for months on end. This doesn’t happen with a drawer; you can pull it out and see everything that’s in there at one glance, keeping things much more organised and tidy. This is the same for clothing storage, if all of your clothes are kept in a cupboard, then the items at the back will get lost from view and never worn and if something isn’t used then it isn’t worth having in your camper conversion. As well as being a blessing for keeping things tidy while living off grid, drawers also make life much easier and less stressful as things are easier to find and also have less chance of falling over and potentially spilling than if they were stored in a cupboard. So, do yourself a favour and swap those big cupboards out for some drawers. 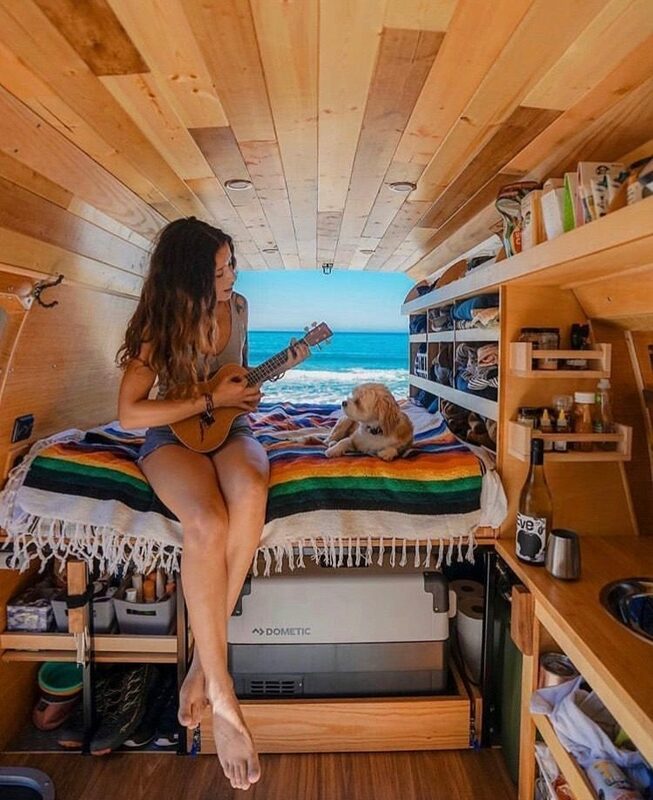 Vandwellers can fit a surprising amount of things in their tiny homes, and this is because they know how to use the space that they have. Every nook and cranny can be used to store something; space simply needs to be properly utilised. 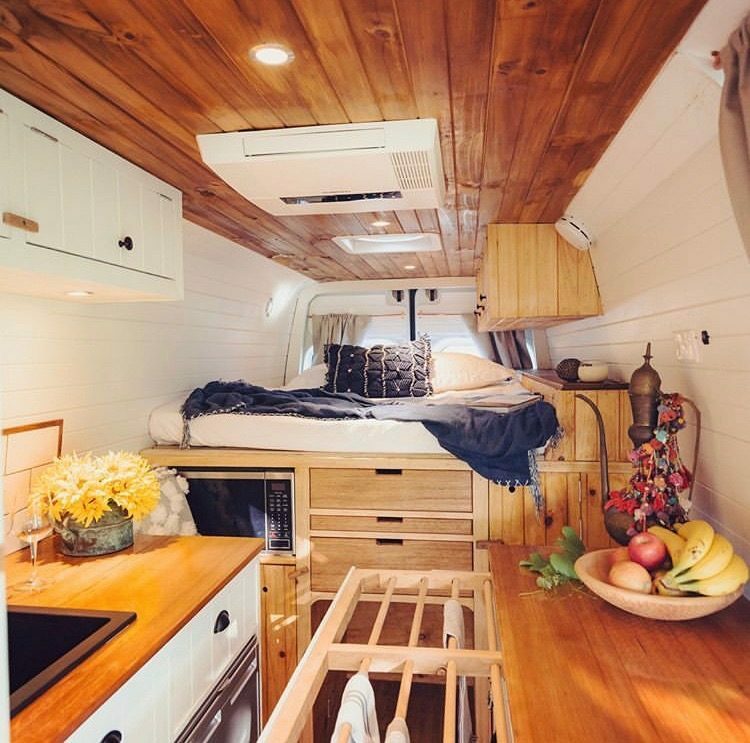 Camper vans and travel trailers can have really clever storage systems built into their layout and, if you’re building out your own tiny home, this stage of staying tidy while living off grid starts in the design stages. Many items inside your tiny home will need to have dual purposes, often this is the primary function and then a storage function. For example seating areas will often have storage areas below the cushions, or it might be where the toilet is stored. If your camper has a fixed bed, there is a whole heap of storage you can utilise beneath it, or maybe you could design a pullout table to store within the bed unit. 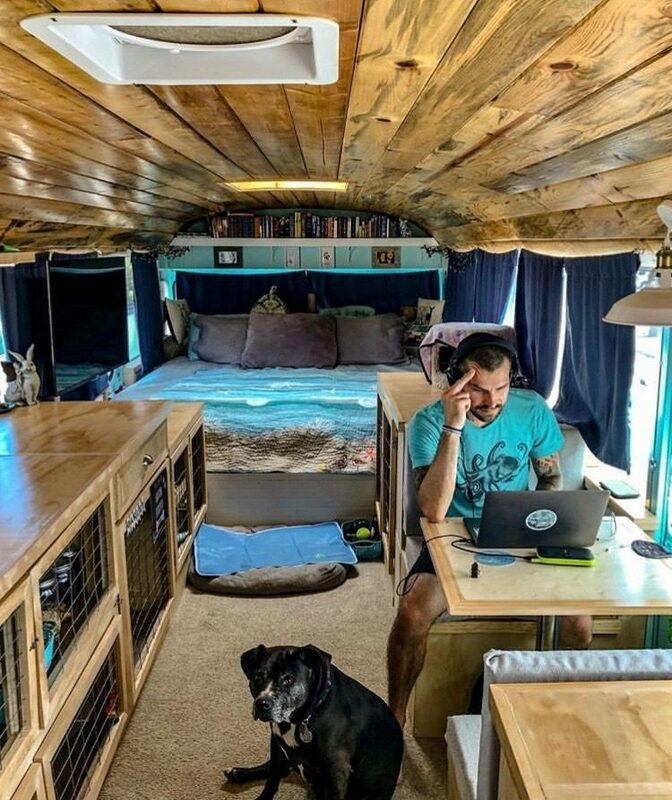 If you don’t want to build your camper for living off grid, you will probably find your factory build will already have a multitude of clever storage areas, so get to know your new home and find what works for you. Living off grid in a small space often means that one drawer/cupboard/storage space is used to store multiple things. What would have once been a space to just store fresh bedding now stores fresh bedding and six other things. A great way to compartmentalise all of your belongings and to stay tidier and more organised while living odd the grid is to use drawstring bags. Drawstring bags keep your belongings contained within their own space, meaning it’s easier to find, stays fresher and has its own space within a larger storage area. Drawstring bags are super easy to make and are a great way to use up old or excess fabric that you might have lying around. You can, of course, buy them but by making them yourself, you can create different sizes, suitable for different things. You can also make them out of different fabric so that they’re easily recognisable from each other or stitch labels to the front, identifying what’s inside. Pack a few spares before you set off on the road, there will always be more things that need storage or their own place to be! Containers within your food storage drawers/cupboards are a great way to keep everything neatly organised while living off grid. This is especially true if you’re living life on the road as jars keep the contents secured, so there is less chance of them spilling while driving. Jars and containers are especially effective if they fit snugly writhing the space they are being stored. This means they won’t fall over when on the move and no storage space will be wasted around them. It’s also a good idea to buy jars or containers larger than the packet of food that you want to fit in it. For example, if you always buy 500g of pasta, make sure you buy a larger container so you can fit the contents of your new packet with any you may have left over. When all food items are stored within their owns container it makes them easy to find as they will always have their own place. This also makes life easier when it comes to organising meals and knowing what ingredients you have left. If you’re an outdoorsy person, then you’re going to need somewhere to store all of your adventure equipment- hiking or travel backpacks, boots, outdoor coats, wetsuits, climbing ropes or whatever gear you take with you while living off grid. It’s a good idea if this area is somewhere easily accessible and also contained away from other items and your main living space. If you have storage accessed through your back doors, then this is a great place for outdoor equipment as it’s generally out of the way and separated from the main living space. Think of this area like a garage or cupboard under the stairs- it’s going to get messy, and a bit dirty from all of your adventures and that’s okay because it is in its own area. This arena wants to be nice and organised so that you can get straight off on your adventures while living off grid, create drawers or get boxes for each different activity, so you always know where everything is, and you can get outdoors quicker! Hooks are such a great way to stay organised while living off grid and they’re so quick, simple and cheap to add to any living space. Hooks are such a great way to store things that don’t have their own place or aren’t ready to go away yet, e.g., wet coats. When they’re not in use hooks, take up next to no space and can also add character to a small space, especially if you choose cute, quirky styles. Hooks are really versatile and can utilise wall space that would otherwise be unused, keeping things organised and easily accessible. Hooks can be used to store many things, on ours we currently have: coats, jackets, workout get drying, swimwear, hats, keys, a bright carnival necklace, tea towel and hand towel, big towels, a lavender bag and lantern in the bed area. We have a lot of hooks, and they are something we added once we’d been living in our tiny home for a while and have helped to stay organised while living off grid. 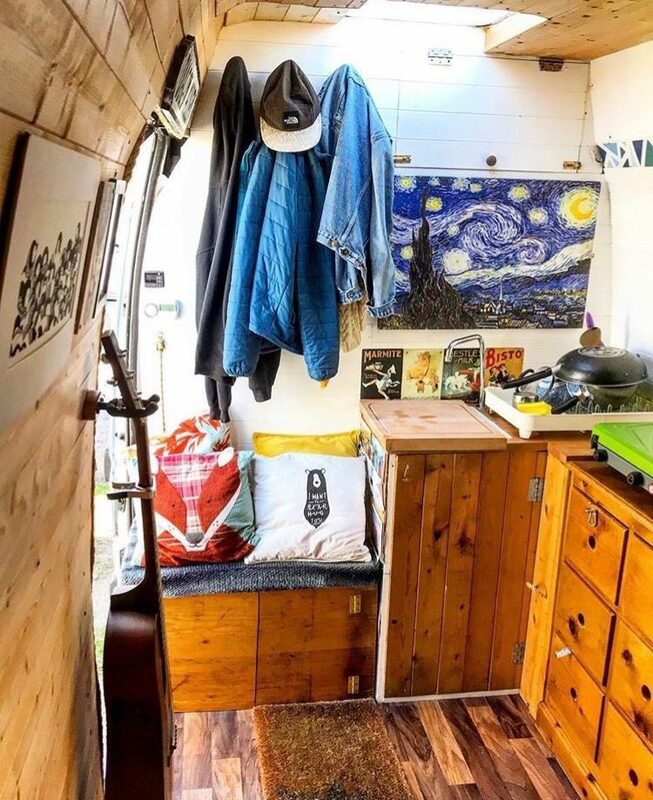 Something that is often forgotten about when thinking about living off grid in a tiny home is storage for mundane items such as dirty laundry. Dirty laundry is something that really needs its own space as it can take up a lot of room, especially if you don’t have a washing machine on board your tiny home when living off grid. No washing machine means washing needs to be done at a laundrette which is probably only going to be done once a month as it’s boring and expensive. That means you need enough space to store one month’s worth of dirty laundry. That’s quite a lot of space. A good area for this could be beneath a seat as it’s a large arena and is hidden away. Alternatively, you could create a draw for your dirty laundry or create a large drawstring bag to store in a bigger cupboard. Something else to think about when creating a storage area for laundry while living off grid is where are you going to store any wet items that will inevitably crop up- swimwear, outdoor gear that’s been rained on, something you’ve hand washed to prevent staining etc. If you’re not in a climate where these items can be easily dried you want a waterproof solution, this could be a box or a waterproof drawstring bag. This may sound really boring, but life can get messy really quick if there’s nowhere to store dirty laundry! Having a routine is a great way to stay tidy and organised while living off grid in a small space. Once you’ve created a space in which everything has its own place you need to set some time aside each day to make sure everything stays organised. This sounds like a big job, but when you’re living in a small space it only takes about 15minutes, there aren’t enough things for it to take longer! A good time to do this is either after breakfast in the morning or before bed in the evening. That way everything is tidy and organised for the day ahead. Setting this time aside each day will mean that everything is in its place when you want to use it, making for a more relaxing day ahead with time spent on the things that matter to you, not on constantly searching for things. Last but not least on the list of how to stay organised while living off grid is a stuff drawer. No matter how tidy and organised you are, there are always going to be things that don’t really have a place to go. Little nik-naks that aren’t big enough to have their own storage area such a sellotape, memory sticks, essential oils, charging cables, plugs etc. but still need somewhere to store. This is where the stuff drawer comes in. Well, it doesn’t have to be a drawer; it could be a bag, box or shelf, whatever works for you! This is an area where you accept it is always going to be messy, where you probably don’t need anything within it but don’t want to throw it away and where you will never be able to find anything. Setting aside one space for all of these bits means they won’t be left lying around and cluttering spaces that are meant to be used for other purposes. We hope you have found these tips interesting and that they will help you to stay tidy while living off grid in a small space. Let us know your thoughts and keep up with the van on Facebook, Instagram and Twitter. More Content From The Van Clan Team! Full time van life is no sacrifice, and here’s why! 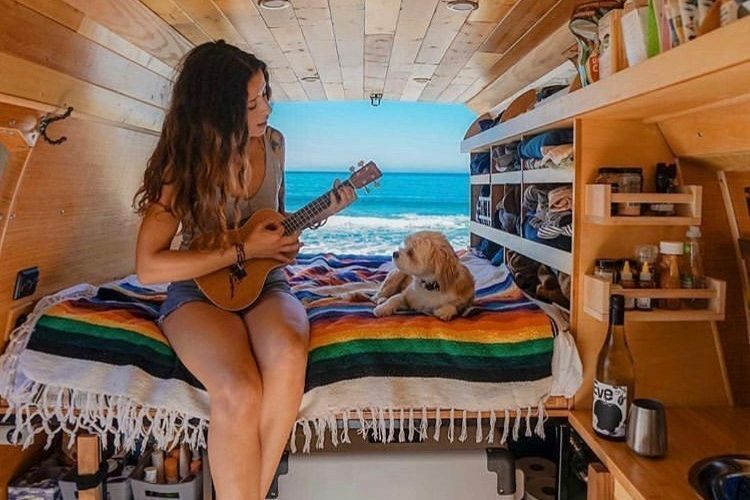 Take the plunge and check out these affordable tiny homes! Add these Van Life Travel spots to your next adventure.